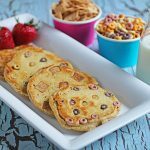 Your traditional whole grain pancake mix will never be the same after you make these fun and creative "cereal-ific" pancakes with your kids! In a bowl, mix together 1 cup of pancake mix with 1 cup milk, 1 egg, and 1 tablespoon vegetable oil. Stir together well and allow it to sit for 15 minutes. It will be runny at first but the mix will thicken as it rests and the whole grain soaks up the liquid. Heat a non-stick griddle or large pan over medium heat. Add more oil or butter to the pan. Pour about 1/4 cup of the batter into the pan to form each of the pancakes. Sprinkle your favorite cereal into the batter of the pancake as it begins to set. Let the pancake cook for about 3 to 4 minutes or until the upside starts to bubble and does not look shiny anymore. Flip the pancake over and cook for another 2 to 3 minutes or until browned and cooked through. Remove from the pan and place on a baking sheet pan while you cook the remaining pancakes. Heat your oven to 200 degrees F and place the cooked pancakes in the oven until ready to serve. Serve with syrup, powdered sugar, peanut butter or your favorite fruit toppings. Place all dry ingredients in a large bowl and mix until thoroughly combined. Store in an airtight container until ready to use. These are great to freeze. If you make an extra batch over the weekend, freeze the leftovers for an easy breakfast or quick dinner when the mood strikes. Read our blog on freezing pancakes if you have never frozen homemade pancakes. We used Fruity Cheerios and Cinnamon Toast Crunch for our pancakes but use whatever cereal you have on hand. Or, have your children help and choose their favorite cereal for their own pancakes. Get creative!